Are upstart competitors taking deadly aim at your company's products and markets? Richard A. D'Aveni, author of the famous attacker's handbook Hypercompetition, presents coun-terrevolutionary strategies and tactics that any industry leader or established company can use to defend itself against revolutionaries, disrupters, or hypercompetitors. The secret lies in making the rules, not breaking them, D'Aveni says, because rule makers still rule. Arguing that "profits and prosperity come not from revolution but stability and orderly change," D'Aveni presents a commanding framework that will enable any resource-rich or clever defender to gain Strategic Supremacy by being first to define the playing field. D'Aveni demonstrates how global powerhouses such as Disney, Microsoft, and Procter &amp; Gamble have achieved preeminence by reconceptualizing their product portfolios as powerful competitive arsenals he calls "spheres of influence." Essentially a new way to compete by restructuring portfolios around a core geographic/product market, spheres enable any company to influence the behavior and positioning of rivals. 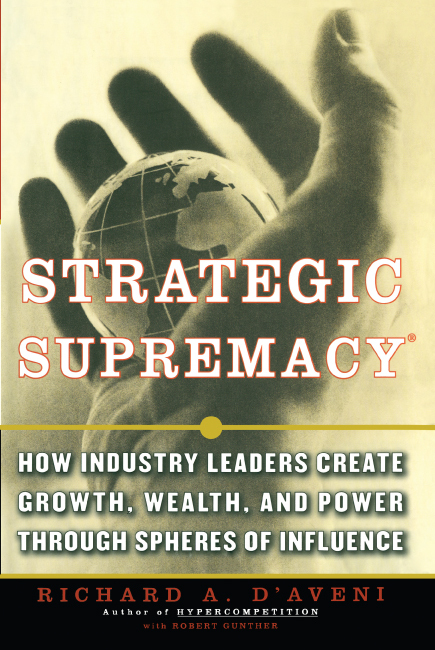 In immensely readable prose, D'Aveni describes how prevailing spheres of influence can be used to create legal business equivalents to a "concert of powers" and other industry structures that mix cooperation with competition. Just one of the potent functions of a corporate sphere, D'Aveni shows, is to contain competitors of equal size (as NBC contained ABC). Spheres can also be used to stabilize an entire industry's global power system. A glance at the detailed table of contents will provide a sense of the wealth of new information contained in this essential handbook of global warfare, including "how-to" tools the reader will need to measure and map the pattern of competitive pressure in any industry and to interpret the meaning and strategic implications of these pressure patterns for his or her position within the industry's power hierarchy.